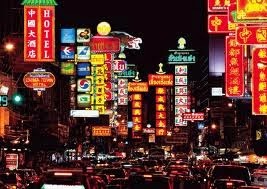 Most large cities in the world must have the Chinatown neighborhood , is no exception to Bangkok . This region is also popularly known as Yaowarat , because it is Yaowarat road passed by . Activity in this area is never quiet . Various spices stores , drug stores , convenience stores market to gold . There are so many interesting things you can find around Chinatown Bangkok . It is suitable for you who like photography to hunting . You can down Charoenkrung Road and enjoy the hustle and bustle in the region , an experience in itself . There Sampeng Lane and Pahurat , where along the way there are outlets textile sellers , which is open from 9 am to 6 pm . A variety of restaurants are also located along the road . Cooking aromas invite for our taste . In this area there is also a famous temple because in it there is a 5 -meter high statue of Buddha made ​​of pure gold weighing 5.5 tons , ie Wat Traimit . Since the number of lane small rivers around Bangkok which empties into the Chao Phraya , the Bangkok which means City of Angels , also nicknamed as the " Venice of the East " , aka the Venice East / Asia . Well , the canals are in Thai called " Klong " , is also interesting to explore . While many channels are now stockpiled to be used as street , but there are many that serve to transport and trade . 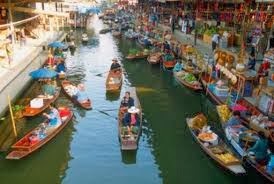 There are several attractions used as a channel to the floating market . Klong become a tourist destination for the tourists . There is also a museum that you can easily go to hire a longtail boat , the Museum of Royal Barges , which stores a collection of wooden boats beautiful kingdom . The roads to Asiatique certainly less exciting guns . Places to shop and hang out are popular among the people of Bangkok and tourists . 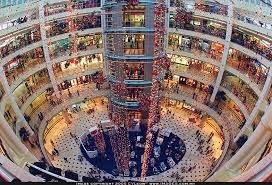 Because the concept is a shopping , dining and recreation that utilize the old warehouses of the era of the early 1900s , so this place is just starting its activities at 5 pm , so visitors are comfortable and not too hot . 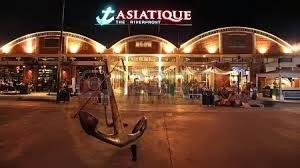 Asiatique is home to hundreds of stores , boutiques , restaurants and cafes . It's right on the edge of the Chao Phraya River , where there are vast courtyard for you to enjoy the view of the river that divides Bangkok , while taking pictures . Oh yes , there is the Bangkok Eye too you know! Giant ferris wheel , where you can see a view of the lights of the water the city of Bangkok from a height , enough to pay for a ticket for 250 baht per person . If anyone plans a trip to Bangkok , make sure you're in town on a Saturday or Sunday , because it is held on the weekend Chatuchak Weekend Market , one of the largest markets in Asia . 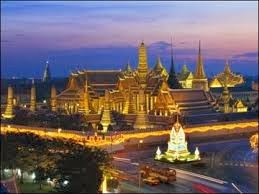 Is a favorite place the week ended Bangkok residents and also tourists . During the commute to Bangkok , I have never seen Chatuchak deserted . Here is the place where you can shop products souvenirs to fashion attractive in small boutiques that are on the near Kamphaeng Phet MRT station . 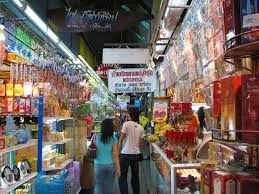 Do not forget to wear comfortable shoes and clothes , get ready circumference and shop until you drop at Chatuchak ! Wat Pho or Wat Phra Chetuphon is a temple that has stood for hundreds of years and is one of the oldest temples in Bangkok . Is home to the Reclining Buddha ( Reclining Buddha ) were plated gold , along 46 meters , with a height of 15 meters . The location of this temple is not far from the Grand Palace , about 10 minutes down the roadside.Kompleks Wat Pho is also an institution to study traditional Thai massage or Thai massage . So in addition to travel , you can also feel all traditional massage , open from 8 am to 5 pm . Entrance to Wat Pho is 100 baht , do not forget to wear decent clothes , as if we go to the Grand Palace . Just like Chatuchak Weekend Market, a place more closely associated with the city of Bangkok is Khao San Road. This small road into a surge for backpackers from around the world. Khao San Road used to be one of Bangkok rice market. But over time eventually grew to where the backpackers hang out because there are many cheap accommodation, ranging from hostels with dormitory rooms, up 3 star hotels. Along the way is filled with a variety of outlets that sell fashion products, accessories and much more. Travel agents, place tattoo, reflexology and more. Finding food is also easy here, many restaurants, cafes, and bars. Ranging from traditional Thai food such as Tom Yum, Pad Thai and Mango Sticky Rice, to international menus. Hawker too much. There are selling spring rolls, fried chicken fried to insects. Khao San Road atmosphere began bustling mid-afternoon until midnight. 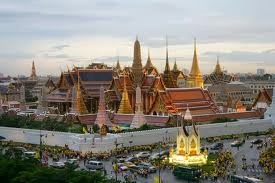 The beauty of the Grand Palace is very mesmerizing. Can be counted as the most beautiful building in Thailand . Built in 1782 , and managed to Otis palace of the kings of Thailand for approximately 150 years. Fusion of western and Thai architecture looks very beautiful , furnished the English-style gardens . But now is not the king's palace Thailand again , but still the Grand Palace in Bangkok sights most tourists came . Inside the Grand Palace complex is the most sacred temple also available in all parts of Thailand , where in it the most sacred Buddha statue . Buddha statue with a height of only about 66 cm is made in the 14th century . Only His Majesty the King of Thailand only allowed to touch and change the Emeral Buddha . In one year , three times the ceremony to replace the clothes of the Buddha , namely summer , winter and rainy season . The event is intended to bring good luck for the state of Thailand in every season . Do not forget if in the Grand Palace should wear modest clothing , namely sleeved shirt ( no tank tops ) , do not wear shorts or sandals . Entrance to the Grand Palace - 500 baht. Known also as the Temple of Dawn , because this temple is very beautiful when viewed against the background of the sunset from the squeeze . But if you are looking at are not so many to be able to take good photos , come in the morning . This temple is one of the oldest temples in Bangkok and popular among tourists. 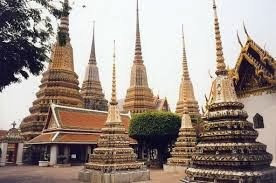 Buildings represent Mount Meru Wat Arun , which according to the teachings of the Buddha is the center of the universe . Wat Arun is located on the Thonburi side , opposite the Rattanakosin Island, where the Grand Palace and Wat Pho are separated by the Chao Phraya river . Wat Arun included as one of the most beautiful temples in Thailand . Prang , or the middle part of the monument as high as 70 meters , a famous landmark not only in Bangkok , but throughout the world . Filled Decorations from China porcelain and glass misaik beautifully appointed . 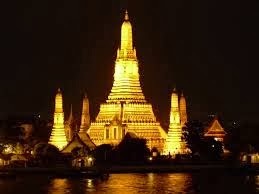 Not surprisingly, Wat Arun become the most favorite destination of travelers, after the Grand Palace . The mall houses six floors of luxury boutiques and shops of international brands such as Aigner , Louis Vuitton , Prada Brioni , Fendi , Gucci and Jimmy Choo . ( Petrosains ) , a world-class marine aquarium called Aquaria , 12 -screen cinema Tanjung Golden Screen and the classical concert hall called the Petronas Philharmonic Hall . Dinner at Suria KLCC is a pretty interesting experience - you can find Indian, Chinese , Malay, Arabic and many other Asian dishes in fancy restaurants here . People with disabilities , the elderly or those who come with children can get a wheelchair or pram at the information counter . Both are free for the first 3 hours . 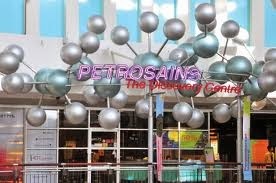 Petrosains is the center of science learning modern children located on the 4th floor of Suria KLCC . Children can learn about petroleum technology and technology is based on fuels such as Formula 1 racing car . 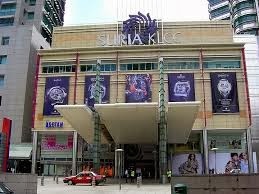 Aquaria can be accessed from the shopping center Suria KLCC through an underground tunnel to the KL Convention Centre . 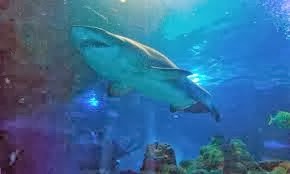 Visitors can buy a package of swimming in the sea aquarium and face to face with sharks here . 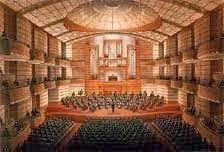 This concert hall is home to the Malaysian Philharmonic Orchestra and can be accessed via the Petronas Twin Towers office block . Most musicals here presented by world-class musicians abroad . This art gallery was established in 1993 to support the development and preservation of art in the country. Admission is free . Kinokuniya Bookstores of Japan as much as two -storey load of books in English, Chinese and Japanese manga comics . TGV Cinemas is located on the 3rd floor of the complex is the largest TGV multiplex in Kuala Lumpur with 12 screens and 2400 seats. Built during the Asian economic crisis , the Petronas Twin Towers in the 88-storey city center are the tallest twin buildings in the world. Inspired by the geometric shapes of Islamic art , this mega structure built as high as 175 meters and is connected by two bridges over the 192 foot level . Residents of this city there , calling two rockets skyscrapers. Some even called it two big iron corn . 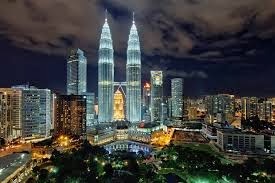 But no matter what the title is given , this is an iconic two towers of Kuala Lumpur . 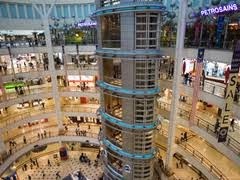 It is also the focal point of the town to stop the international class hotels , luxury shopping center Suria KLCC , art galleries, an interactive science center Petrosains, aquaria and a world-class philharmonic hall under one roof. 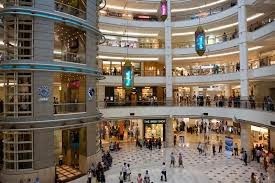 Luxury shopping center has more than 270 stores , a food court with international food , movie theaters and fast food restaurants . If you love manga comics from Japan , do not forget to Kinokuniya bookstore on the 4th floor . Nearby is a park built tower equipped children's play area 2 acres , fountains , wading pool and jogging track. This world-class aquarium can be visited through the pedestrian tunnel under the floor of KLCC . Those who want to maintain eye with sharks can buy a package Dive With Sharks . Located on the same floor with Kinokuniya bookstore , science discovery center called Petrosains vast allows you and your children see and play with the objects on display. These include the Formula 1 race cars , oil rigs and helicopter simulators . Here also you can enjoy classical or jazz performances in a world-class hall with a seating capacity of 865 .Kuala Lumpur Convention Centre, Kuala Lumpur Convention Centre is located a few minutes walk from KLCC. It is a center for conventions , trade shows and public exhibitions . Republic of the Union of Myanmar ( also known as Burma , is called " Burma " in the Western world ) is a country in Southeast Asia . Country area of ​​680 thousand square kilometers has been ruled by the military since a coup in 1988. This country is a developing country and has a population of over 50 million people . The capital of the country formerly located in Yangon before being transferred by the military government to Naypyidaw on November 7, 2005 . Change the name of Burma became Myanmar conducted by the military government on June 18, 1989 . The military junta changed the name of Burma to Myanmar in order to be non - Burmese ethnic feel part of the country . However, this name change is not completely adopted by the international community , especially in the British Commonwealth countries .Some European countries such as Britain and Ireland that does not recognize the legitimacy of the military junta still use " Burma " to refer to the country . 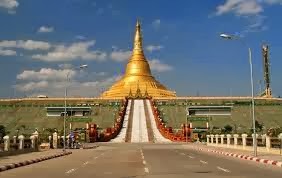 Naypyidaw ( also spelled Nay Pyi Taw ) is the national capital of Myanmar is now located in the Village Kyatpyae , City of Pyinmana , Mandalay Province . Kyatpyae in Myanmar language means ' run in the bottom of struggle ' . Naypyidaw means ' City / Imperial Palace ' , but also interpreted as a ' throne ' " . Activity administrative capital of Myanmar was officially moved to a vacant land about two miles west of Pyinmana on November 6 , 2005. Naypyidaw approximately 320 kilometers north of Yangon . the capital 's official name was announced on the Day of Military Force (Armed Forces Day ) in March 2006 . Required nine hours by train to get from Yangon to Naypyidaw . Trains departing at 21.00 and arriving at 06.00 local time . To serve the new capital , which is now at the airfield Ela upgraded to handle larger aircraft . It is located about 10 miles southeast Kyatpyae . All local airline in Myanmar - Myanmar Airways , Yangon Airways , Air Mandalay and Air Bagan latest - the goal has included Naypyidaw as between Naypyidaw and provide services to other cities in Myanmar . In mid- March 2006 , Air Mandalay launch flights between Yangon and Naypyidaw and on June 5, 2006 , Air Mandalay flight launched between Naypyidaw and Thandwe ( Sandoway ) and Sittwe ( Akyab ) in Rakhine State , to give civil servants better access to western region of Myanmar . Phnom Penh is the is the capital of the state frangipani. This airport can never have recognized as the "Pearl of Asia" in the days of the 1920s and have cultivated the art of Khmer and French. Phnom Penh is a dealer who has the most population in the frangipani, namely 1 million, in addition to being a center of trade, politics and culture of the country.This airport has been the capital of frangipani since the 15th century, when the king Ponhea Yat moved the administrative center of the Khmer kingdom of Angkor Thom which debuted controlled by Siam. Cambodia , located in the southeast of the square of the Asian continent , between 10 and 15 degrees north latitude and 102 to 108 degrees East Longitude , already assured of tropical climates such as the South East Asian countries other . As a result of natural conditions that consists mainly of low plains , and also because of pressure from the waters of the Gulf of Thailand area, causing more climate Cambodia tinged with a long monsoon season between rainy season and dry season with average temperatures ranging from 21 to 35 degrees Celsius. B. March to May is the dry season , reaching its peak in April. D. Month from September to October is the rainy season . By the end of the season , for the love of photography, now is also one of a great time for trips to Cambodia. Lao People's Democratic Republic (Lao language: Sāthālanalat Pasāthipatai Pasāson Lao) is the only country without a coastline of Southeast Asia and bordering Myanmar and China to the northwest, Vietnam to the east, Cambodia to the south and Thailand to the west. After independence from France in 1949, Laos faces a civil war that ended in 1975 when the communist Pathet Lao took power. Laos is among the countries which have economic and political freedom lowest in the world. History of Laos can be connected to the Lan Xang kingdom (Land of a Thousand Elephants), a Southeast Asian governments that emerged between the 14th century until the 18th century..Vientiane is a major city of Laos, located in the southwestern part of the country.In 1989 the province was divided into two prefectures Vientiane (Vientiane city where located) and the rest of the province. Laos is a country oppressed by mainland Southeast Asia and covered in dense forest which is mostly mountainous , one of which is Phou Bia highest with an altitude of 2,817 m above sea level . Laos also has some plains and plateaus . The Mekong River forms a large part of the western boundary with Thailand , whereas the mountains of the Annamite Chain form most of the eastern border with Vietnam . Laos climate is tropical and characterized by monsoons . The rainy season lasts from May to November , followed by a dry season from December to April . The capital and largest city of Laos is Vientiane , other major cities include Luang Prabang , Savannakhet and Pakse . In 1993 , the government set aside 21 % of the area of ​​the country as National Biodiversity Conservation Area ( National Biodiversity Conservation Area / NBCA ) , which may be developed into a national park . 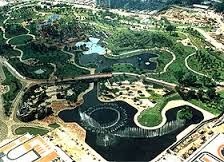 When it has finished , it is expected to be the best and largest national park in Southeast Asia . Laos is the only Southeast Asian country that has not pinched and marine areas . 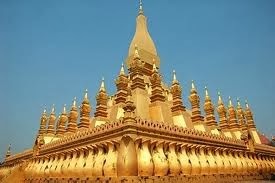 Laos is located in the west of Vietnam , is the north boundary of China . Other neighboring countries are Thailand and Myanmar in the west side of the southern sea . The total area is 236.800 km2 Laos . Approximately 70 % of Lao -shaped mountains and are as high as 2,819 meters Bia Mountain is the highest mountain in the country . Approximately 55 percent of this area is covered by various types of forests , namely tropical rain forests, bamboo forests , and mixed forests with tropical vegetation . Climatic conditions in Laos are manifold tropical climate with an average temperature of between 24 ° C to the north and 26 ° C south. In Laos there are 3 seasons , the rainy season with hot air . Usually when this area was under the influence of southwest monsoon from June to October . Then, the cool dry season , when the winter winds come from the west of the month from November to February . And the latter is the hot dry season , often occurs in March to May. Hanoi ( in Vietnamese : Hà Nội ; Chu Nom :河内) , an estimated population of 3,500,800 inhabitants ( 1997) , is the capital of Vietnam and was once the capital of North Vietnam from 1954 to 1976. It is located on the right bank of the Red River . Industry Vietnam is produced machine tools , plywood , textiles , chemicals and hand knitted . 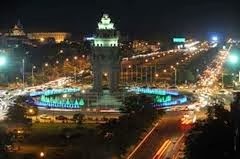 Hanoi became the capital of Vietnam in the 7th century . Its name is derived from the Chinese, Kinh Djong , became Tonkin and Europeans used to the whole territory of Vietnam. Hanoi colonized by the French in 1873 and handed over to him ten years later . He became the capital of French Indochina after 1887. 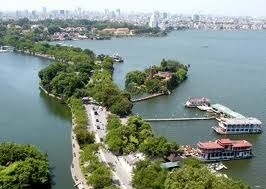 Hanoi colonized by Japan in 1940 , and was released in 1945 , when he became the administrative center of Vietnam . From 1946 to 1954 , Hanoi became the location of fierce resistance between the French and Vietnamese soldiers . Since then , Hanoi became the capital of North Vietnam . South Vietnam unite on July second, 1976 . Hanoi has a humid subtropical climate features ( Köppen CWA ) with a lot of precipitation . The city experienced the typical climate for the northern region of Vietnam , where season a very hot and humid , and when his winter , by national standards , relatively cool and dry . Summer , lasts from May to September , hot and humid , with annual rainfall Template : Conver . Winter is rapid , relatively dry , with spring get little rainfall . Manila ( Maynila in Filipino language ) is the capital of the Philippines . It is located on the eastern edge of Manila Bay in the Philippines largest island and north , Luzon . Although there are several places of poverty , this city is one of the cosmopolitan cities of the world and its metropolitan area is the center of economy , culture , education and industry of this country . Manila is often called the Pearl of the Orient . Manila is the metropolitan area with a population of over 10 million people . This metropolis called Metro Manila , but Manila is often simply referred to by foreigners , and in addition there population , consisting of 17 cities and municipalities . The city is the second most popular city in the Philippines after Quezon City , the former capital of the Philippines . 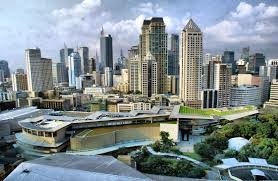 Manila and the surrounding areas serve as a single entity to simplify the Metro Manila area growth is super fast . Today, the city and the metropolis victorious as cultural and economic center . But the city also has the problem of over- population , congestion , pollution . In the Köppen climate classification system , Manila features a tropical climate is humid and dry climate that borders on a tropical monsoon . As with other areas in the Philippines , Manila entirely in the tropics . Its existence to the equator describe a small temperature range , less likely to be below 20 ° C and higher than 38 ° C. However , humidity levels are usually higher which led to a warmer climate . 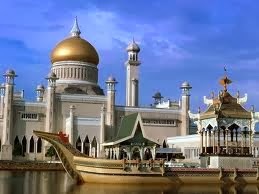 Bandar Seri Begawan , estimated population 46,229 inhabitants ( 1991 ) , is the capital of the sultanate of Brunei Darussalam . The city is a manufacturer of furniture , textiles , handicrafts , and timber . Here is where the Royal Ceremonial Hall , Building Signs Greatness Kingdom and Brunei History Centre . The city is also unique in that it has a village near the water , Kampung Ayer who has a house on stilts and stretches down to the sea as far as 500 m . The first part of its name comes from the Persian airport بندر and means ' port ' or ' residence ' . Bandar Seri Begawan has a tropical climate with no definite dry season . The city has a high level of humidity throughout the year and only had one dry month with an average rainfall of 120mm per year . October to December is the month with a very high rainfall , humidity two days every three day . Like all cities with a tropical climate , the average temperature is stable throughout the year , with the average highest temperature reached 32 C and the lowest average temperature of 23 c .
Brunei is located in the coastal marshy and covered with mangroves. Height in Brunei is the highest hill in Pagon, reaching 1,850 meters high. This hill is located at the southern tip of Temburong district, Brunei East. In Brunei the west flowing three big rivers, namely Sungai Belait, Tutong and Sungai Brunei . Belait River is the longest river Brunei. Brunei Temburong river flowed to the east. These rivers were harnessed for communication and transport water. Brunei berilim equatorial hot and humid. The average annual temperature of 27.8 degrees Celsius. The annual rainfall average in the hilly area south of about 4,000 millimeters. The rainy season falls in the months of May to December. While the dry season falls in the month of January to April. ( 1527-1619 ) , Batavia / Batauia , or Jaccatra ( 1619-1942 ) , and Djakarta ( 1942-1972 ) . Jakarta also has nicknames like J - Town , or more popular again The Big Durian because the city is considered a comparable New York City ( the Big Apple ) in Indonesia . Jakarta has an area of approximately 661.52 km ² ( oceans : 6977.5 km ² ) , with a big population of 10,187,595 inhabitants ( 2011) . Metropolitan area of Jakarta ( Jabodetabek ), which has a population of approximately 28 million inhabitants , is the largest metropolis in South East Asia or second order in the world . As the center of business , politics , and culture , Jakarta is home to the headquarters of state-owned enterprises , private companies , and foreign companies . The city is also the seat of government agencies and the ASEAN secretariat office . Jakarta is served by two airports , namely Soekarno - Hatta and Halim Airport , as well as a sea port in Tanjung Priok . Jakarta is located in the north of the island of Java , at the mouth of the Ciliwung River , Jakarta Bay . Jakarta lies in the lowlands at an average elevation of 8 meters above sea level . Just south of Jakarta is a mountainous area with high rainfall . Jakarta crossed by 13 rivers that it all comes down to the Bay of Jakarta . The most important is the Ciliwung River , which divides the city into two . East and south of Jakarta, bordering the province of West Java and the west of the border with the province of Banten . Thousand Islands is an administrative district located in Jakarta Bay . About 105 islands located 45 km ( 28 miles) north of the city. Jakarta has a hot air temperature and dry or tropical climates . Located in the western part of Indonesia, Jakarta experienced the peak of the rainy season in January and February with an average rainfall of 350 millimeters with an average temperature of 27 ° C. Rainfall between the months of January and early February are very high , that's when Jakarta was flooded every year , and the peak of the dry season in August with an average rainfall is 60 millimeters . In September and early October are the days that are very hot in Jakarta , temperatures can reach 40 ° C . The annual average temperature ranges between 25 ° -38 ° C ( 77 ° -100 ° F ) . Singapore officially the Republic of Singapore , is an island country off the southern tip of the Malay Peninsula , 137 kilometers ( 85 miles) north of the equator in Southeast Asia . The country is separated from Malaysia by the Straits of Johor to the north , and from the Riau Islands , Indonesia by the Singapore Strait to the south . 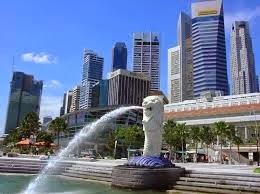 Singapore is the fourth leading financial center in the world and a cosmopolitan world city, playing a vital role in international trade and finance . The Port of Singapore is one of the five busiest ports in the world . Singapore has a long history of immigration . Diverse population amounted to 5 million people , made ​​up of Chinese , Malay , Indian , various Asian , and Caucasian . 42% of the population in Singapore are foreigners who work and study there . Foreign workers make up 50 % of the service sector . The country is the second most populous in the world after Monako.AT Kearney ranks Singapore as the most globalized country in the world in the 2006 Globalization Index . Before independence in 1965 , Singapore was a vibrant trading port with a GDP per capita of $ 511 , the third highest in East Asia then it.After independence , foreign direct investment and the government's efforts for industrialization based on plans the former Deputy Prime Minister Dr . Goh Keng Swee shaping Singapore's economy today . The Economist Intelligence Unit in its " Quality of Life Index " ranks Singapore as having the best quality of life in Asia and eleventh in the world . Singapore has the ninth largest foreign reserves in the world . The country also has an advanced armed forces . Singapore consists of 63 islands , including mainland Singapore . The main island is often called the Singapore Island but is officially called the Island Ujong ( Malay : transliterated as island at land's end ( peninsula ) . Artificial There are two bridges towards Johor , Malaysia : the Johor- Singapore Causeway in the north , and the Tuas Second Link in the west . Jurong Island , Island tekong , Pulau Ubin and Sentosa are the largest of several small islands in Singapore . highest natural point is Bukit Timah Hill with a height of 166 m ( 545 feet ) . Singapore has a land reclamation projects with earth obtained from the hills, the seabed , and neighboring countries . As a result, Singapore's land area extends from 581.5 km ² ( 224.5 mi ² ) in the 1960s to 704 km ² ( 271.8 mi ² ) on this day , and will be expanded again to 100 km ² ( 38.6 mi ² ) in 2030 . This job sometimes requires some small island coupled through land reclamation to form larger islands and useful , for example Jurong Island .